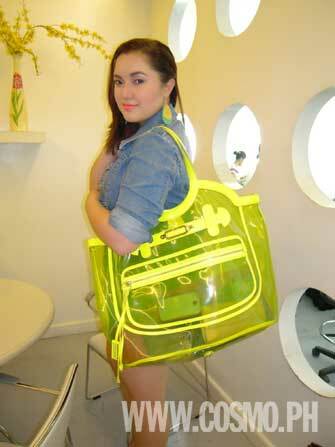 Cosmo pried open the funky neon bag of this celebrity daughter and stylist to the stars. See what's inside. If you're an avid reader of fashion magazines, the name Alyanna Martinez is familiar to you for sure. Showbiz watchers probably recognize those mestiza features, too, as they're inherited from her celebrity parents Albert and Liezl Martinez and her grandmother Amalia Fuentes, another showbiz royalty. Despite her showbiz lineage, this stunning princess chose a different path. She prefers to work behind the scenes by styling famous celebrities instead. She is responsible for making stars look fabulous and pretty in their stunning gowns or outfits and adorning them with striking, bold accessories. Alyanna’s fashion-related hard work paid off. She is a nominee for TV show Us Girl’s 2010 Stylist of the Year Awards in August. The winner will be decided based on viewers' votes. Cosmopolitan Magazine also regularly gets her to style our cover girls, including Bea Alonzo for her May 2010 cover. But in last month's issue, Cosmo also shot Alyanna together with her barkada of fashion writers, entrepreneurs, and stylists for a fun fashion spread. Cosmo.ph seized that opportunity to find out moment to find out what a stylist like her brings to her fabulous work everyday. We were pleasantly surprised to see that the cute transparent tote that we were eyeing before the shoot was in fact hers! The contents of her neon bright Jimmy Choo tote were as quirky as its contents, which range from Chanel makeup to Etude House and Hello Kitty lip gloss tubes. She has various designer pouches compartmentalizing different items in her bag. See how this stylish girly-makeup lover organizes the contents of her designer bag by launching our gallery.